The Taipei Zoo in Taiwan is very large and relatively new with beautiful landscaping, plenty of places to picnic and rest and very nice animal enclosures. Long and narrow, it is built up the side of one of Taipei's many hillsides, so as you go through the zoo, you'll be going uphill. It has 12 outdoor animal areas and 10 indoor areas. Say it in Chinese: "tie pay dong oo yoo ahn"
Admission: check the zoo's official website for prices. The outdoor features include a "Formosan" Animal area which includes animals native to the island of Taiwan, a Fern Garden, Insect Valley, Children's Zoo, Asian Tropical Rainforest Animals, Water Garden, Australian Animals, Desert Animals, African Animals, Bird World, Temperate Zone Animals, and Wetland Park. Perhaps because of the rain, we were most impressed by the hippo exhibit - the best I've ever seen outside seeing wild ones in the Serengeti. In a very large enclosure, you are able to look down upon a large pond filled with hippos. Miniature hippos hang out in an area above the large hippo enclosure. The indoor enclosures include an educational center, Insectarium, "conservation corridor", children's theater, Koala house, a special exhibit house, nocturnal animal house, cool energy conservation house, amphibian and reptile house, and penguin house. Inside the special exhibit house when we visited were some Giant Pandas that clearly get a lot of visitors on busy days (during our rainy visit we were three of about 7 total visitors). The most exciting for us was the koala house. Each up on their own tree, we enjoyed watching these cuddly guys snooze. Yes, very. There were a few places where one would have to carry a stroller up or down stairs but for the most part, there are ramps and relatively smooth rolling. 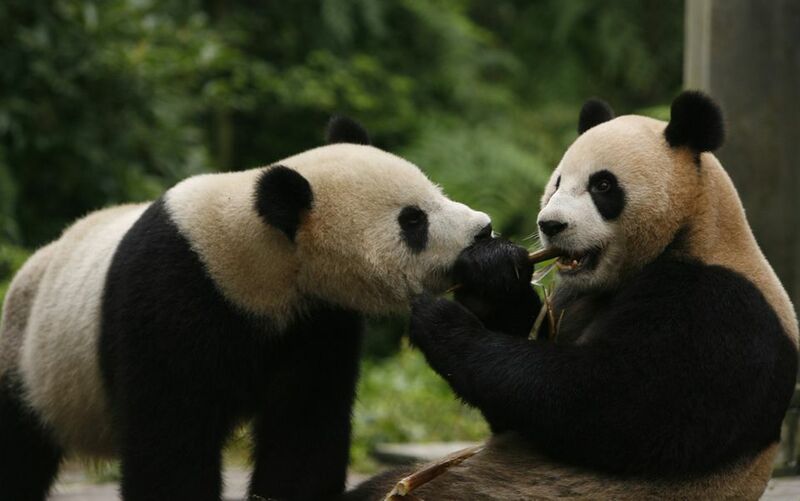 If you have a fear of quality when it comes to Asian zoos, you can put that to rest when you visit the Taipei Zoo. Probably second only to the famous Singapore Zoo, it is a really lovely space with beautiful gardens, plenty of fun, interesting animals, and lots of space for kids to run and have a good time while parents stroll through the wide, stroller-friendly, landscaped paths.